The City College of San Francisco produces a yearly Fashion Show with students in the Fashion department undertaking production. Aspiring designers (usually senior-year Fashion students) prepare collections to walk the runway, with the award being a scholarship at a local fashion school. The show includes a “Gallery” segment, featuring individual student creations. After completing the jacket, I decided on a lark to submit it for consideration in the gallery. I presented the garment to the jurying committee, consisting of the students of the Fashion Show Production class, other faculty, and the chair of the Fashion Department. The response to the jacket was positive. Could I provide a pant, as well as a top to complete the look – with the deadline for model fittings two weeks away? Standing in front of the committee, looking somewhat like a deer in headlights – I hadn’t expected this at all – I stammered out “Yes, if the jacket is chosen, I can commit to that.” Two days later, I got the news: the jacket was chosen to appear in the show. So what was once a class project has expanded into a full look for a fashion show. 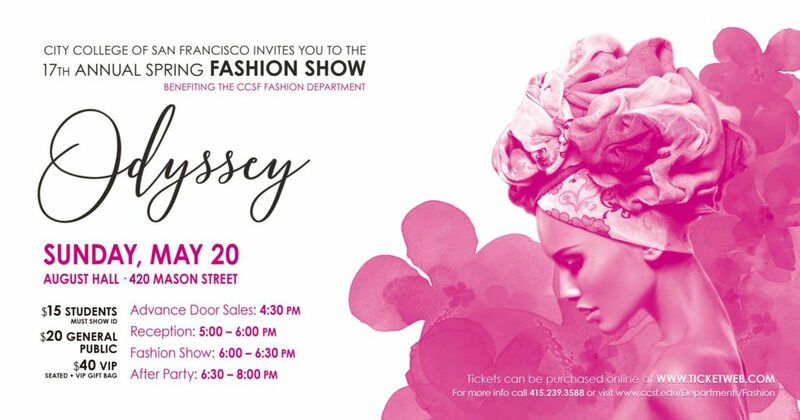 If you are interested in attending “Odyssey”, the 17th annual spring Fashion Show from City College of San Francisco, visit the Fashion Department’s Facebook page. The event is May 20. Tickets are $15 for students, $20 for the general public and can be purchased at ticketweb.com. The design for the jacket has changed since the first installment in this series. Here’s some model photos from the jurying session. The color blocking design has changed from the original concept, to a set of diagonal lines that slope from the back all the way to meet at center front. This design emerged while trying out ideas on the dressform and I’m much happier with it. Here’s a take from one of the design sessions. The design was draped on a fitting muslin using strips of grosgrain ribbon. To simplify matters somewhat, the sleeve no longer incorporates a zipper at the wrist. Instead, two front pockets sit right on the seam between the orange and teal stripes, with an invisible zipper as an enclosure. (If you look carefully at the model photo, you’ll spot the zipper pull). There were many steps involved in the patternmaking, fitting and construction process, but I will save those for follow-on articles. The pant serves two purposes. It is part of the look for the show, but also an assignment for the same Apparel Construction course I made the jacket for. My first plan was to make myself a nice dress pant using some grey wool and the pattern I had custom-fitted in last semester’s Fitting class. But as I hadn’t actually started the pant, I was able to change course and make a pant destined for a model to walk the runway. The model has not been selected yet, so I am making a guess in terms of measurements up front. I chose a standard Burda pattern from my pattern stash, with the silhouette I am looking for. I’m adding some extra seam allowance at the waist for fitting, and also some extra length in the leg to give me some flexibility for hemming. Other than that, the design and fit are straight from the pattern envelope. 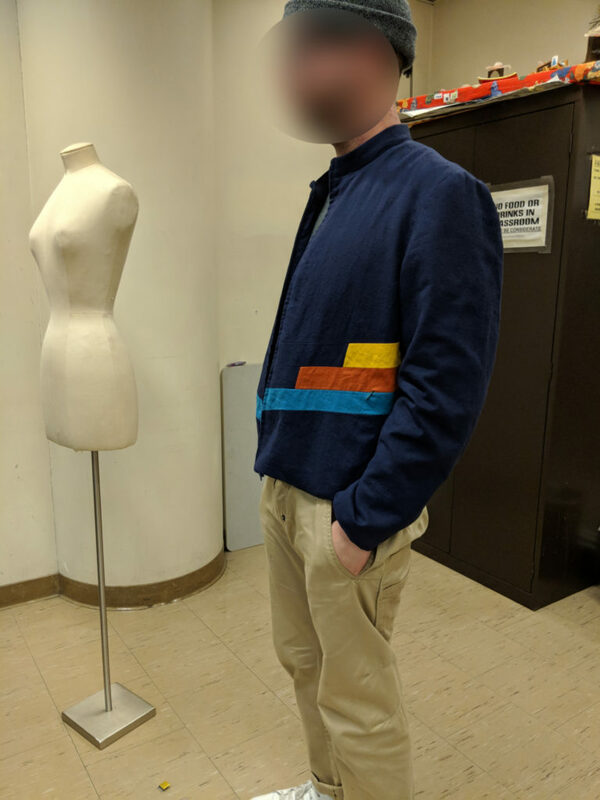 I did alter the pattern to incorporate the construction techniques I am required to perform for the Apparel Construction course. 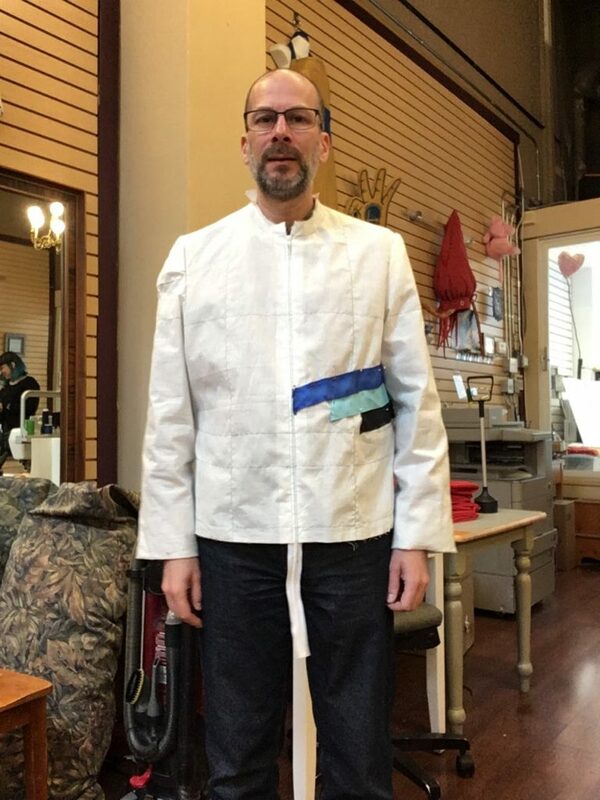 I removed the cut-on facing from the waistband, to allow commercial waistband curtain to be used instead. I added a Right Fly pattern piece to allow constructing a traditional French Fly. And I threw out the pattern piece for constructing the welts. The back pockets will be double-welt pockets, again using the techniques from class. The jurying committee gave me some helpful feedback. They would like to see the pant tie in with the jacket to provide a unified look, much like a very casual suit, rather than a display of separates. I’ll share with you my style designs for the pant in a future post, but for now here is the color palette with the light steel blue of the pant added. 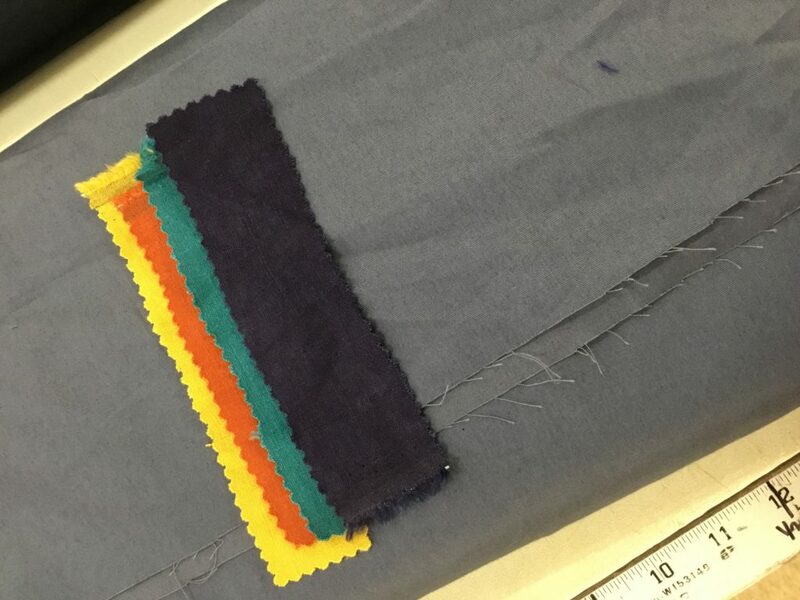 The pant fabric is a somewhat lightweight (for a pant) cotton twill, with a bit of sheen on the right side. For the top, I want a very simple garment in a light, neutral color. Something that will provide a backdrop in terms of contrast, but not compete with the jacket. Something that will allow the audience to clearly see the jacket when the model opens and closes the zip, or removes it. Also, given the time frame involved, it needs to be simple and easy to construct. So a simple T-shirt fits the bill. 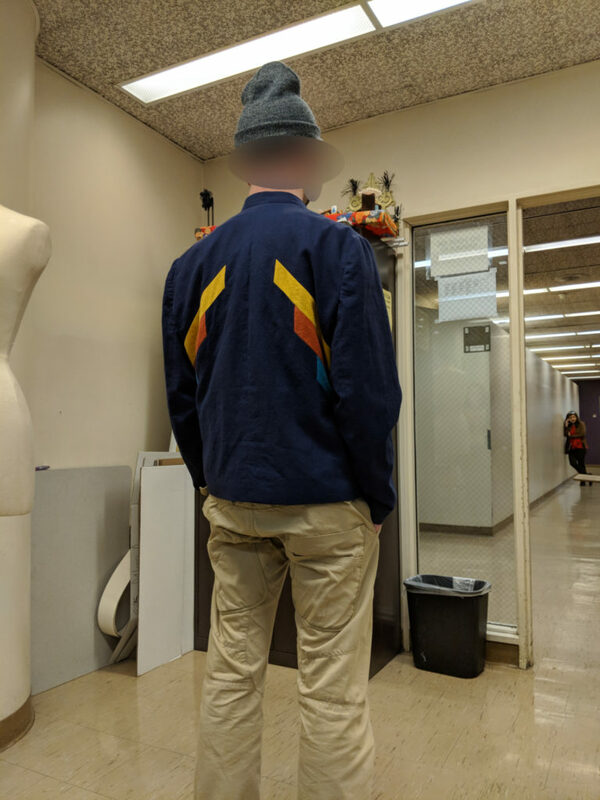 I asked the committee if I could just use a purchased T-shirt – it isn’t really meant to be on exhibit, it’s more to clothe the model so he can show off the jacket. But the organizers make a point of advertising everything that walks the runway is student-made. So, I am making a T-shirt. For fabric, I got some donations of knit fabric from my instructor, as well four cuts of cotton pique 4-way stretch fabric from a classmate: black, white, light blue, light grey. Black is too close to the color of the jacket and won’t set it apart, and white is too stark. Light blue and light grey could both work, but I don’t really want to add another blue to the overall look. So I think the light grey cotton stretch pique is the way to go. 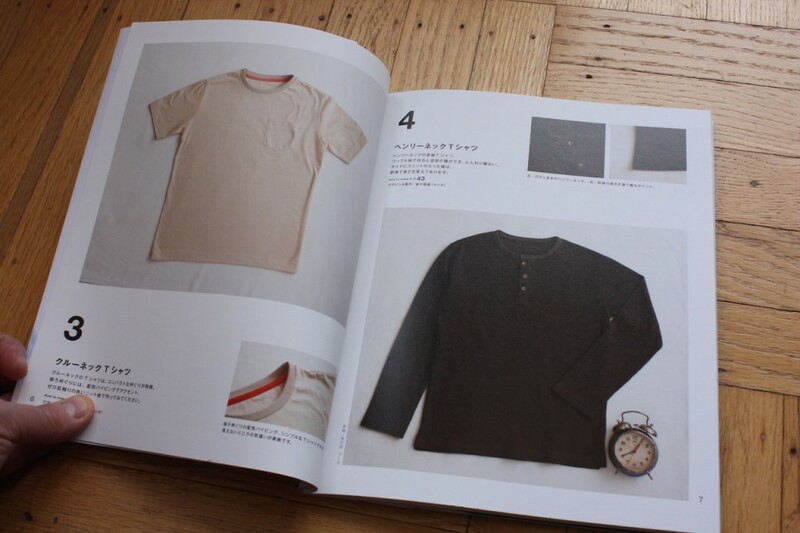 I am using a T-shirt pattern from the Japanese pattern book Basic Style Menswear. Not being confident in the sizing from the patterns in this book, I will use the black knit pique to make a fitting muslin for tryout on the model. I am pleased to announce I am now teaching two classes on zippers at Sips N Sews, a sewing studio in San Francisco. The basic class will cover essential information on zippers including how to shorten them and use zipper feet. Students will sew their own samples of exposed and centered zippers. The intermediate class will cover lapped zipper insertion, invisible zippers, as well as a zippered fly used in pants. The courses will be offered in May and June. If you are interested, you can sign up at the Sips n Sews Website. You don’t need to have a membership at the studio to take the class (though members get a discount). The Basic class is a pre-requisite for the intermediate class (or contact me first if you have prior zipper experience). There is a materials fee for both classes, but we will try to keep that as low as possible. Was about to send out a search and rescue party. Congratulations on being selected for the fashion show. Your jacket is au currant (that means, “right up with the times”, Michael). Can’t wait to see the pants. A casual city look, for changeable weather and what-not. Looking smart in line at a coffee shop, and a punctuation to any city sidewalk one is circulating upon. Grey was THE choice for the t-shirt – it’ll have more outings than there have been conversations about Tom Cruise. Glad to read of your progress, and your turn toward the professorial. I haven’t visited your blog in quite some time. I always thought you’d get further faster with classes. And now you have. Cool jacket! Thank you, and thank you for thinking of me to visit my blog once again.